In the lectionaries of the various Latin rites, one of the most prominent Gospels of the Lenten season is that of the Samaritan woman who spoke to Christ at the well of Jacob (St John 4, 5-42). Although the Roman, Ambrosian and Byzantine Rites each read this Gospel on a different day, it appears in all three as a lesson of particular importance for the preparation of those who will be baptized at Easter or Pentecost. In the Roman Rite, it is read on the Friday of the third week, joined with one of the most important epistles of Lent, Numbers 20, 1-13, in which Moses makes water run from the rock in the desert. This story was understood by the early Christians as a prefiguration of the sacrament of baptism, starting with St Paul himself, who tells us that “our fathers were all under the cloud, and all passed through the sea. And all in Moses were baptized, in the cloud, and in the sea: and did all eat the same spiritual food, and all drank the same spiritual drink; and they drank of the spiritual rock that followed them, and the rock was Christ.” (1 Cor. 10, 1-4) Moses striking the rock to make the water run from it is one of the most frequently depicted Biblical scenes in early Christian art; just in the paintings of the Roman catacombs, it appears over 70 times, along with numerous other representations on ancient sarcophagi. 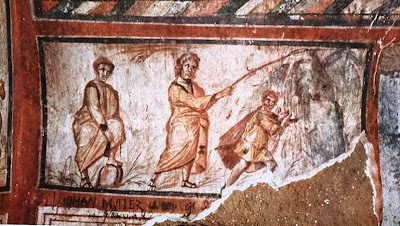 Moses making the water run from the rock in a fourth-century fresco in the Catacomb of St Callixtus. On the previous Sunday, the Lenten station is kept at the church of St Lawrence Outside-the-Walls, where anciently the catechumens underwent a formal examination of their Christian faith, the ritual known as the scrutiny. The Gelasian Sacramentary contains a beautiful prayer for them to be said on that day, “that they may worthily and wisely come to the confession of Thy praise; so that through Thy glory they may be reformed to the former dignity which they had lost in the original transgression.” At the same Mass, the Memento of the living has an interpolation to pray for their future godparents, and during the Hanc igitur, the names of the catechumens were read out loud. On the following Friday, the station is kept at another church of Rome’s most venerated martyr, St Lawrence ‘in Lucina’, nicknamed, like so many sacred places in the city, for the woman upon whose property it was originally built. Here, they would hear Christ speaking to the Samaritan woman of the “living water … springing up unto life everlasting”, and understand His words as a clear reference to baptism. A piece of the gridiron of St Lawrence’s martyrdom, preserved in a reliquary in a side-altar of San Lorenzo in Lucina. Photo courtesy of Orbis Catholicus. The dedicatory inscription on the counter-façade of Santa Sabina in Rome, the only part of the church’s original mosaic decoration which survives, ca. 425 A.D. The two figures on the sides are “the church from the circumcision” on the left, and “the church from the gentiles” on the right. Photo courtesy of Fr. Lawrence Lew, O.P. 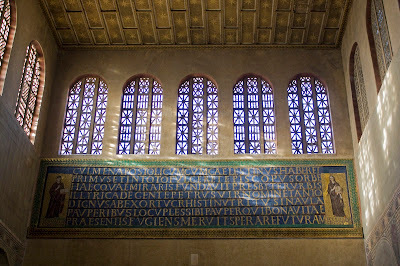 In the Roman Rite, the same prophecy of Ezechiel (though not exactly the same words) provides both the introit and the first epistle of the Mass of the Wednesday of the fourth week of Lent, on which day the catechumens were exorcized and blessed at the tomb of St Paul, the great Apostle of the gentiles. Truly it is worthy and just…through Christ our Lord. Who, to instill (in us) the mystery of His humility, being tired, sat at the well, and * asked of the Samaritan woman that a drink of water be given Him, even He that had created the gift of faith in her; and so He deigned to thirst for her faith, so that, as He asked water of her, He might enkindle in her the fire of divine love. * We therefore beseech Thy boundless compassion, that defying the dark depths of vice, and leaving behind the vessel of harmful desires, we may ever thirst for Thee, that art the fountain of life, and source of all goodness, and may please Thee by the observance of our fast. Through the same etc. The words here noted between the stars form the basis of a Preface used in the Ordinary Form of the Roman Rite in the first year of the three-year lectionary cycle, when the story of the Samaritan woman is read on the third Sunday of Lent. Since this crucial passage is not included among the readings of the second and third years, a rubric provides that it may be read on Sunday in place of the Gospels assigned to those years, or it may displace one of the ferial Gospels; a similar provision is made for the blind man and Lazarus. The Orthodox church of Jacob’s Well, also known as St Photini’s, in the city of Nablus on the West Bank. 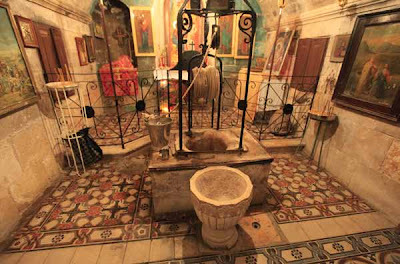 The current church is the fifth structure to stand over the site, which has been venerated by Christians as the Well of Jacob since the fourth century. Exapostilarion of Easter Having fallen asleep in the flesh as a mortal, O King and Lord, You rose again on the third day, raising up Adam from corruption, and abolishing death. O Pascha of incorruption, O salvation of the world! 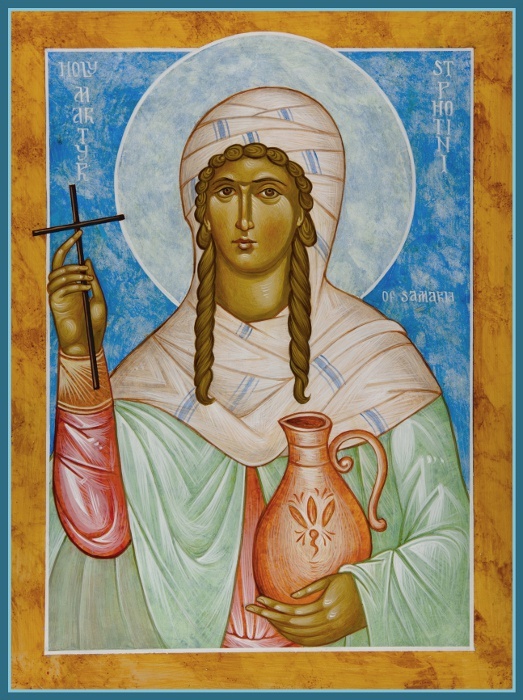 of the Samaritan Woman You reached Samaria, and talking with a woman, sought water to drink, my all-powerful Savior, who poured out water for the Hebrews from a sharp rock, and led her to belief in you: and now she enjoys life eternally in heaven. of Mid-Pentecost At the mid-point of the feast, Lover of mankind, you came to the temple and said: You who are full of thirst, come to me and draw living water welling up, through which you will all revel in delight and grace and immortal life. The text of this second Gospel of the “living waters” is deferred by the Byzantine Rite to Pentecost itself, a custom which it shares with the Ambrosian and Roman Rites in different ways. The church of Milan preserves to this very day an ancient custom of celebrating two Masses on both Easter and Pentecost, the traditional days for the administration of baptism; one is the Mass “of the solemnity” itself, and another “for the (newly) baptized.” On Easter Sunday, the Gospel at the Mass for the baptized is John 7, 37-39, with the second part of the last verse omitted. On great day of the festivity, the Lord Jesus stood and cried, saying: If any man thirst, let him come to me, and drink. He that believeth in me, as the scripture saith, Out of his belly shall flow rivers of living water. Now this he said of the Spirit which they should receive, who believed in him. At the Mass for the baptized on Pentecost, this Gospel is repeated, adding the final words of verse 39 which are not said on Easter, “for as yet the Spirit was not given, because Jesus was not yet glorified.” In the Roman Rite, the same text provides the Communion antiphon for the Mass of the vigil of Pentecost, although the Gospel itself is read on the Monday of Passion Week. The Byzantine Rite has traditionally honored the Samaritan woman as a saint, and she was often called both an Apostle and Evangelist. Her legend states that she, her five sisters and two sons were among those baptized by St Peter and the other Apostles on the first Pentecost, and afterwards traveled to preach in many places; after evangelizing Carthage, they came to Rome, where they were martyred under Nero. Her given name is Photeine (or “Photini” in the modern pronunciation), the Greek word for “bright”; the cognate “photistes – illuminator” is used in the Byzantine tradition as a title for the saint who first evangelizes a people, the best-known example of this being perhaps St Gregory the Illuminator of Armenia. With the latinized form of her name, Photina, she was added to the Tridentine edition of the Roman Martyrology by Cardinal Baronius, along with her family members, on March 20th, the day of her feast in the Byzantine Rite. Her troparion makes the same association between the waters of baptism and the coming of the Holy Spirit on Pentecost indicated by the placement of her Gospel on the Sunday after Mid-Pentecost. Wholly illuminated by the divine Spirit, and sated of your thirst by the springs, you drank deeply of the water of salvation from Christ the Savior, all praiseworthy one, and shared it abundantly with them that thirst; o Great Martyr and Equal to the Apostles, Photini, entreat Christ our God to save our souls.